The night after a party which culminated in an argument with her husband, Per, in front of their friends, the body of Helena and that of her dog, are found butchered on a beach on the Swedish island of Gotland. When Per’s fingerprints are found on the murder weapon the prosecutor instructs Inspector Anders Knutas to charge Per with killing his wife. But the Inspector is not entirely convinced and is proven right to have his doubts what appears to be a second victim of the same killer is found. When the first body is found, Stockholm-based news journalist Johan Berg receives a tip off phone call from someone who has been supplying him with useful information for years. Johan’s boss sends him and a photographer to the islands to see what they can learn. It turns out, however, that Johan’s source knows much more than the police are willing to reveal and Inspector Anders Knutas start to wonder who is leaking information to the press. When Johan interviews Helena’s best friend she mentions something that Johan feels compelled to tell the police as it’s something that he feels could help the investigation. With the holiday season just opening the police have a race against time to find the killer before he or she strikes again and to prevent the summer season being a washout. With so little to go and not much to make good news, Johan starts to do some digging of his own and gradually a connection between the victims seems to take shape. While Unseen doesn’t break any new ground, it does introduce a new setting and a new detective. I knew only a little about Gotland but it was enough to grab my attention so I was disappointed when I didn’t get much of a feel for the place from the novel. I did learn that the island is a popular place for holidays, especially with people from Stockholm and that it has a much slower pace of life than the mainland. While the story wasn’t entirely dependent on the setting, the location did have some part to play. Perhaps future books in the series will explain more about the setting, I do hope so. The use of an island for the setting is very clever, though, because it adds an element of tension; in a small community not only are strangers looked upon with suspicion but the locals start to wonder about each other too. Could anyone they know be responsible for such terrible crimes? Is the killer still on the island? The desolate island landscapes also added to the chilling feeling and I felt that in terms of landscape this location proved excellent because there was a definite sense of isolation that had a profound effect on the characters. That said it could still have been any island in northern Europe, I certainly didn’t feel any connection with Gotland in particular. Inspector Knutas is not the lonely, lugubrious detective of most contemporary crime fiction, but a contented, family man. Of course, he has the usual problems with troublesome superiors and, like many detectives in rural locations, this case sees officers from the mainland with more experience in the detection of violent crimes being sent to “assist”. Although it’s quite refreshing that Knutas doesn’t completely follow the Wallander model, it does mean that the character is a little weak. Strangely the character of Johan is much better and he makes more engaging investigator than Knutas. I wondered if this is because, before writing novels, the book’s author Mari Jungstedt worked as a journalist; maybe she could identify more easily with the journalist than the detective? Johan is a much more engaging character than Knutas and, as an investigative journalist, could easily become the central character in a series of crime novels, after all, need the hero always be a police officer? While I liked this detective and found the story initially quite interesting, I worked out the outcome quite early on and I’m pretty sure this wasn’t intended by the author. Unseen isn’t one where the killer’s identity is known to the readers and they watch as the police put together the evidence, closing in on the perpetrator. However, at intervals we get to hear the killer’s voice and gradually the reader gets a quite well shaped picture of who this is, at least I did and was able to easily work out the motive for the killings. I suppose the plot is fairly well constructed but it could have benefited from a twist or two as, really, it was too straightforward. The conclusion was quite rushed which would have been more of a let down had I not guessed what was coming; I felt that this was an indication of a novice writer and I can see enough promise in Jungstedt’s writing to suggest that this is something that will be improved on. In spite of one or two flaws I found Unseen quite an enjoyable read. 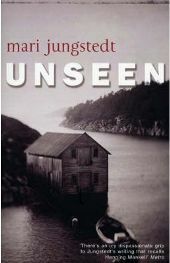 Mari Jungstedt’s main problem is that she will inevitably be compared with Henning Mankell and her characters just don’t compare. But Mankell really is the king of Scandinavian crime fiction, in a league of his own, and it’s not fair to judge a new author against such tough standards. This is a good start, though and I will certainly be reading the next in the series as I don’t feel that this first novel is enough to judge Jungstedt by. Note – this is a translation into English by Tiina Nunnally. The translation is good and flows very naturally though it is noticeably American English.